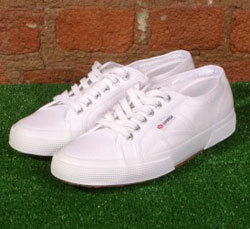 Superga has been making rubber soled footwear in Italy since 1913, so it’s safe to say the brand has some heritage. And while some of the label’s range can probably be classed as weird and wonderful, the simplicity of the Superga 2750 Cotu Classic pumps does work. A basic white shoe with canvas upper, removable insole and vulcanised rubber sole. For a stroll to the pub on a summer’s day, you can’t go wrong. They’re available now for £34.99.